By now you’ve probably heard about the Tom Waits/Joker video that’s circulating around the Internet, and let me tell you, it is downright creepy. For those of you who don’t know, this video shows an interview with musician Tom Waits from The Don Lane Show in Australia back in 1979 and you’ll see there is a definite connection between him and Heath Ledger’s Joker. Waits was touring for his album Blue Valentine. Listen to his voice and watch his mannerisms. 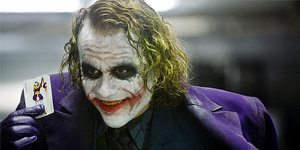 The similarities between him and Ledger’s Joker are undeniable. It’s hard to imagine that Ledger didn’t use Waits as some sort of inspiration for the Joker, but who would’ve thought that the man with the crazy voice on The Don Lane Show in 1979 would go on to inspire one of the greatest theatrical performances of all-time. It’s funny how life works.